This is a scalable context timeline. 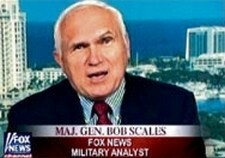 It contains events related to the event April 20, 2008: Networks Claim Ignorance of Analysts’ Connections to Pentagon, Defense Firms. You can narrow or broaden the context of this timeline by adjusting the zoom level. The lower the scale, the more relevant the items on average will be, while the higher the scale, the less relevant the items, on average, will be. 'Writing the Op-Ed' for the War - As a result, according to Clarke’s aide Don Meyer, Clarke decides to make the military analysts the main focus of the public relations push to build a case for invading Iraq. They, not journalists, will “be our primary vehicle to get information out,” Meyer recalls. The military analysts are not handled by the Pentagon’s regular press office, but are lavished with attention and “perks” in a separate office run by another aide to Clarke, Brent Krueger. According to Krueger, the military analysts will, in effect, be “writing the op-ed” for the war. Working in Tandem with the White House - The Bush administration works closely with Clarke’s team from the outset. White House officials request lists of potential recruits for the team, and suggests names for the lists. Clarke’s team writes summaries of each potential analyst, describing their backgrounds, business and political affiliations, and their opinions on the war. Rumsfeld has the final say on who is on the team: “Rumsfeld ultimately cleared off on all invitees,” Krueger will say. Ultimately, the Pentagon recruits over 75 retired officers, though some only participate briefly or sporadically. Retired Army general James Marks, who begins working as an analyst for CNN in 2004 (until his firing three years later—see July 2007) is a senior executive with McNeil Technologies, and helps that firm land military and intelligence contracts from the government. 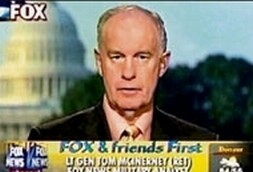 Thomas McInerney, a retired Air Force general and Fox News analyst, sits on the boards of several military contractors. 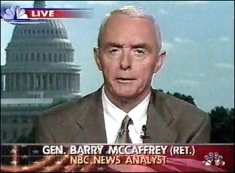 Two of NBC’s most familiar analysts, retired generals Barry McCaffrey and Wayne Downing, are on the advisory board of the Committee for the Liberation of Iraq, an advocacy group created with White House encouragement in 2002 to push for the overthrow of Saddam Hussein. [New York Times, 4/20/2008] Additionally, McCaffrey is chief of BR McCaffrey Associates, which “provides strategic, analytic, and advocacy consulting services to businesses, non-profits, governments, and international organizations.” [Washington Post, 4/21/2008] Other members include senators John McCain (R-AZ) and Joseph Lieberman (D-CT), and prominent neoconservatives Richard Perle and William Kristol. [Truthout (.org), 4/28/2008] Both McCaffrey and Downing head their own consulting firms and are board members of major defense contractors. Some Criticism Leveled - Several journalists later write harsh critiques of the conference and the media’s complicity (see March-April 2003). Bernard Trainor. [Source: PBS]The New York Times examines the influence of retired military officers in influencing public opinion on the invasion of Iraq. 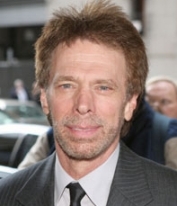 Reporter John Cushman, Jr writes that “a whole constellation of retired one-, two-, three- and four-star generals—including many who led the recent wars in Afghanistan, Kosovo, and the Persian Gulf—can be seen night and day across the television firmament, navigation aids for viewers lost in a narrative that can be foggier than war itself.” All of the news broadcasters, including cable news outlets CNN, MSNBC, and Fox News, and the commercial networks’ news shows on ABC, CBS, and NBC rely on retired military officers to explain to their viewers what is happening in Iraq. Cushman acknowledges the “deep perspective” that the retired officers bring to the war coverage, particularly those who led the same units now on the ground, or at least “commanded, trained, or shared barracks and beers with the current commanders.” Retired Marine General Gregory Newbold recently told an ABC News audience, “If things haven’t gone exactly according to script, they’ve gone according to plan.” Newbold helped draw up the plans for the invasion as director of operations for the Joint Chiefs of Staff. Inherent Contradictions - Rampton notes that using the propaganda model as a communications strategy on such a large scale is impossible in the long term. One problem the Bush administration is facing is in countering the growing disaffection with the US among other nations while simultaneously refusing to listen to criticism from these nations. 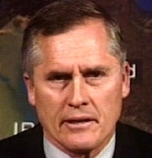 He cites as examples Defense Secretary Donald Rumsfeld’s contemptuous dismissal of European opponents to the Iraq invasion as members of “old Europe” (see January 22, 2003), and Bush’s dismissal of recent worldwide protests with over 11 million participants by saying he doesn’t “decide policy based upon a focus group.” Rampton writes, “Bush’s statement speaks volumes about his inability to think outside the framework of a propaganda model of communication.” The Bush administration is an avid consumer of polls, though it goes to extraordinary lengths to give the impression that it does not. 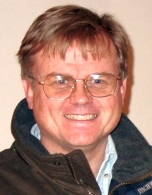 Columnist Joshua Green recently wrote that instead of using polls to determine policy, as the Clinton administration was often accused of doing, in the Bush White House, “[p]olicies are chosen beforehand [and] polls [are] used to spin them.… Because many of Bush’s policies aren’t necessarily popular with a majority of voters, [his pollsters’] job essentially consists of finding words to sell them to the public.” The administration has similar problems with spreading propaganda among foreign nations, particularly among Middle Eastern nations. Rampton writes: “The real problem with the Bush administration is that it doesn’t listen to anything but focus groups. It never thinks of public opinion as worth considering in its own right, and instead merely uses it to refine the message points that go out each day in its ‘Global Messenger’ emails” (see January 2003). Militaristic Newsmen - It is not just the retired officers who provide a militarist perspective, McCarthy observes, but the reporters and anchormen themselves. With examples of ABC’s Ted Koppel and NBC’s Brian Williams donning helmets before the cameras, or Fox’s Geraldo Rivera proclaiming in Afghanistan that “[W]e have liberated this country” (and his cameraman shouting, “Hallelujah!”), “the media are tethered to the military,” McCarthy writes. “They become beholden, which leads not to Pentagon censorship, as in 1991 (see October 10, 1990), but a worse kind: self-censorship” (see September 10, 2003). 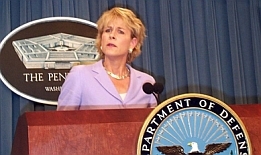 'Home Run' - The Iraq tour is viewed as what reporter David Barstow will call “a masterpiece in the management of perceptions.” Not only does it successfully promote the administration’s views on Iraq, but it helps fuel complaints that “mainstream” journalists are ignoring what administration officials and war supporters call “the good news” in Iraq. “We’re hitting a home run on this trip,” a senior Pentagon official says in an e-mail to the chairman and vice chairman of the Joint Chiefs of Staff, Richard Myers and Peter Pace. The Pentagon quickly begins planning for future trips, not just to Iraq but to Afghanistan and Guantanamo Bay (see June 24-25, 2005) as well. These trips, and the orchestrated blitz of public relations events that follow, are strongly supported by the White House. Gordon Cucullu. [Source: The Intelligence Summit]“Independent military analyst” Gordon Cucullu, a former Green Beret, is an enthusiastic participant in the Pentagon’s Iraq propaganda operation (see April 20, 2008 and Early 2002 and Beyond). Cucullu has just returned from a half-day tour of the Guantanamo detention facility (see June 24-25, 2005), and is prepared to give the Pentagon’s approved message to the media. David Grange. [Source: CNN]CNN airs commentary from three of its “independent military analysts,” some of whom will later be cited as participants in the Pentagon’s Iraq propaganda operation (see April 20, 2008 and Early 2002 and Beyond). 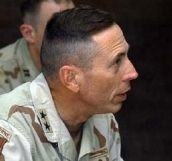 The analysts are retired Army Brigadier General James “Spider” Marks (whom CNN will later fire for conflicts of interest—see July 2007), retired Air Force Major General Donald Shepperd, and retired US Army Brigadier General David Grange. The topic is Defense Secretary Donald Rumsfeld and whether he should resign. After Marks confirms that Rumsfeld repeatedly refused requests from field commanders to send more troops into Iraq during critical battlefield moments (see April 16, 2006), CNN anchor Wolf Blitzer raises the issue of other retired generals calling for Rumsfeld’s resignation. Grange - Grange dismisses the resignation demands as coming from “a small number of general officers…” Grange says he does not have a close relationship with Rumsfeld, but admits that he participates in “occasional” briefings with Rumsfeld and Pentagon officials. Grange says “it would be inappropriate [for Rumsfeld] to step down right now,” and adds that it really isn’t the generals’ business to make any such recommendations. Smarting from the media criticism sparked by the “Generals’ Revolt” and the subsequent revelation of Pentagon attempts to manipulate the media in response (see April 14-16, 2006), about 17 military analysts (see April 20, 2008 and Early 2002 and Beyond) meet with Defense Secretary Donald Rumsfeld and Joint Chiefs of Staff Chairman General Peter Pace. The subject, according to a transcript of the session, is how to marginalize war critics and pump up public support for the war. (Only Rumsfeld and Pace are identified by name in the transcript.) One analyst says bluntly: “I’m an old intel guy. And I can sum all of this up, unfortunately, with one word. That is Psyops [psychological operations]. Now most people may hear that and they think, ‘Oh my God, they’re trying to brainwash.’” Rumsfeld cuts the analyst off with a sarcastic comment: “What are you, some kind of a nut? You don’t believe in the Constitution?” Rumsfeld’s words draw laughter. Few of the participants discuss any of the actual criticism from the former generals. Iraq Losses 'Relative' in Comparison to 9/11 - The analysts, one after the other, tell Rumsfeld how “brilliant” and “successful” his war strategy is, and blame the news media for shaping the public’s negative opinion about the war. One participant says, “Frankly, from a military point of view, the penalty, 2,400 brave Americans whom we lost, 3,000 in an hour and 15 minutes [referring to the 9/11 attacks], is relative.” An analyst says: “This is a wider war. And whether we have democracy in Iraq or not, it doesn’t mean a tinker’s damn if we end up with the result we want, which is a regime over there that’s not a threat to us.” Rumsfeld agrees with the assessments. The biggest danger, the analysts agree, is not in Iraq, but in the public perceptions. The administration will suffer grave political damage if the perception of the war is not altered. “America hates a loser,” one analyst says. 'Crush These People' - Most of the session centers on ways Rumsfeld can reverse the “political tide.” One analyst urges Rumsfeld to “just crush these people,” and assures him that “most of the gentlemen at the table” would enthusiastically support him if he did. “You are the leader,” the analyst tells Rumsfeld. “You are our guy.” Another analyst suggests: “In one of your speeches you ought to say, ‘Everybody stop for a minute and imagine an Iraq ruled by al-Zarqawi.’ And then you just go down the list and say, ‘All right, we’ve got oil, money, sovereignty, access to the geographic center of gravity of the Middle East, blah, blah, blah.’ If you can just paint a mental picture for Joe America to say, ‘Oh my God, I can’t imagine a world like that.’” Several of the analysts want to know what “milestone” they should cite as the next goal; they want to, as one puts it, “keep the American people focused on the idea that we’re moving forward to a positive end.” The suggestion is to focus on establishing a new and stable Iraqi government. Another analyst notes, “When you said ‘long war,’ you changed the psyche of the American people to expect this to be a generational event.” They are also keenly interested in how to push the idea of a war with Iran. When the meeting ends, an obviously pleased Rumsfeld takes the entire group and shows them treasured keepsakes from his life. Outgoing Defense Secretary Donald Rumsfeld (see November 6-December 18, 2006) holds one of his final meetings with a group of retired military officers who serve as “independent analysts” for various television news broadcasts. The analysts are integral parts of a widespread Pentagon propaganda operation designed to promote the Iraq war (see April 20, 2008 and Early 2002 and Beyond). Rewriting History - When Rumsfeld is asked about former Army Chief of Staff General Eric Shinseki’s statement that he believed it would take several hundred thousand US troops to keep the peace in post-invasion Iraq (see February 25, 2003), Rumsfeld attempts to rewrite history, suggesting that he was ready to send more troops, but the commanders on the ground did not want them. He is asked: “What’s become conventional wisdom, simply Shinseki was right. If we simply had 400,000 troops or 200 or 300? 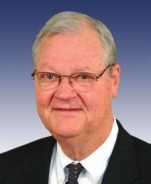 What’s your thought as you looked at it?” Rumsfeld replies: “First of all, I don’t think Shinseki ever said that. I think he was pressed in a congressional hearing hard and hard and hard and over again, well, how many? And his answer was roughly the same as it would take to do the job—to defeat the regime. It would be about the right amount for post-major combat operation stabilization. And they said, ‘Well, how much is that?’ And I think he may have said then, ‘Well maybe 200,000 or 300,000.’” Both Pace and an analyst tell Rumsfeld that Shinseki’s words were “several hundred thousand,” and Rumsfeld continues, “Now it turned out he was right. The commanders—you guys ended up wanting roughly the same as you had for the major combat operation, and that’s what we have. There is no damned guidebook that says what the number ought to be. We were queued up to go up to what, 400-plus thousand.… They were in the queue. We would have gone right on if they’d wanted them, but they didn’t, so life goes on.” [Chicago Tribune, 5/7/2008] In reality, Rumsfeld and his deputy Paul Wolfowitz publicly derided Shinseki’s estimation, and hounded him into early retirement for his remarks (see February 27, 2003). And one of the commanders in the field that Rumsfeld cites, General James “Spider” Marks, has already noted that Rumsfeld personally denied multiple requests from the field for more troops (see April 16, 2006). 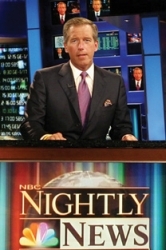 John Baptiste, appearing on a CBS News broadcast. [Source: CBS News]CBS News fires retired Army Major General John Batiste as a paid “military analyst” after Batiste takes part in an advertisement that criticizes the Iraq strategy of President Bush. CBS says Batiste’s participation violates the network’s standards of not being involved in advocacy. CBS spokeswoman Linda Mason says if Batiste had appeared in an advertisement promoting Bush’s policies, he would have been fired as well. “When we hire someone as a consultant, we want them to share their expertise with our viewers,” she says. “By putting himself… in an anti-Bush ad, the viewer might have the feeling everything he says is anti-Bush. And that doesn’t seem like an analytical approach to the issues we want to discuss.” Batiste retired from the military in 2003, and since then has been an outspoken critic of the conduct of the war. In the advertisement, for the VoteVets Political Action Committee, Batiste said: “Mr. President, you did not listen. You continue to pursue a failed strategy that is breaking our great Army and Marine Corps. I left the Army in protest in order to speak out. Mr. President, you have placed our nation in peril. Our only hope is that Congress will act now to protect our fighting men and women.” [United Press International, 5/11/2007; CBS News, 5/11/2007] Two days after the ad aired, CBS fires Batiste. [Oregon Salem-News, 5/16/2007] Batiste, an Iraq veteran who describes himself as a “diehard Republican,” tells MSNBC’s Keith Olbermann that he and his colleagues at VoteVets are “patriots… VoteVets is not an antiwar organization. We’re focused on what’s best for this country. We’re focused on being successful and winning the effort against global terrorism.” He says he agreed to make the ad with VoteVets “because I care about our country, and I care about our soldiers and Marines and their families.” He says that because he is retired, he has the freedom to speak out. [MSNBC, 5/10/2007] The progressive political organization MoveOn.org calls the firing “censorship, pure and simple.” The Oregon Salem-News notes that CBS routinely employs analysts and commentators who advocate for the Bush administration, including former White House communications director Nicolle Wallace, who is, the Salem-News writes, “known for using her position to push White House talking points.” Wallace is also a consultant for the presidential campaign for Senator John McCain (R-AZ), and according to the Salem-News, CBS did not object when Wallace appeared on its broadcasts to promote his candidacy. [Oregon Salem-News, 5/16/2007] Batiste is not a participant in the Pentagon’s propaganda operation to promote the Iraq war that uses retired military officers as “independent analysts” to echo and elaborate on Pentagon and White House talking points (see April 20, 2008, Early 2002 and Beyond, and May 1, 2008). Peter Hart. [Source: Seattle Post-Intelligencer]Following up on the New York Times’s story of the Pentagon “psyops” campaign to manipulate public opinion on the Iraq war in 2002 and beyond (see April 20, 2008 and Early 2002 and Beyond), Democracy Now! examines the almost-total lack of antiwar voices “analyzing” the Iraq war and occupation on the mainstream news broadcasts and in the nation’s newspapers.